It’s episode 126! And it’s AGAIN all about the hot button topics! 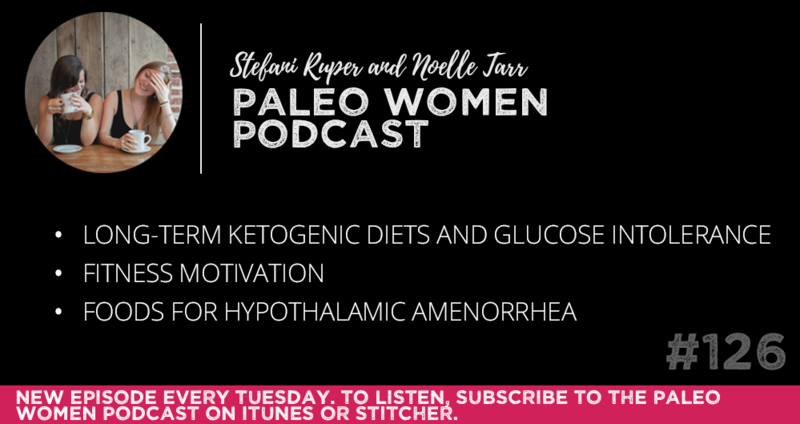 This week, Noelle and I discuss long-term Ketogenic diets and glucose intolerance, fitness motivation, and foods for hypothalamic amenorrhea. Sun Basket is a fresh ingredient and recipe delivery service that uses organic, sustainably sourced, seasonal ingredients from the country’s top farms. Sun Basket makes it easy to cook delicious, gluten-free or paleo meals in your own kitchen in just 30 minutes or less, making it perfect for those who are busy, on-the-go, and balancing tight schedules. When you sign up for Sun Basket, you’ll get organic, fresh, non-GMO ingredients sent directly to your door each week that are pre-measured, so there’s no waste, hassle, or grocery shopping. And now, Sun Basket now offers gluten-free family meal options, making it easy to customize to your needs. As a special offer for our community, Sun Basket is offering THREE free meals with your first order. To get this special deal, go to http://sunbasket.com/paleowomen. That’s right, when you sign up, you’ll get three totally free easy to prepare meals with your first order.